kysk, usually spelled ｋｙｓｋ and pronounced "kee-yo-shee-kee", is a Japanese Smash 64 player who is considered the second-best Kirby main in the world after Fukurou. His tag is the same in Japanese tournaments. He often choses the red kirby, but uses all different colors and often switches colors between matches. He is also known for his Pikachu which he used very often since 2018, especially against Kirbys, as well as his Falcon against Pikachus. He got 5th at both the national events Kansai 2015 and Kanto 2013 and won Waseda Festival 2014. 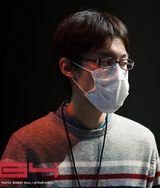 He improved since, taking 3rd and 4th place at Kanto 2016 and Japan Smash Cup 2016 (getting eliminated by Fukurou both times) and won two Japanese majors in 2017, at Kansai 2017 against Gyaki and at Autumn Kanto Tournament against Kurabba. On his first trip to compete in the states, he entered GENESIS 4 and placed an astounding 3rd place, taking sets off of Wizzrobe and Mariguas. His second US tournament was GENESIS 5 a year later where he placed 5th losing to Fukurou and getting eliminated by KeroKeroppi. In 2018, he got 4th at Kansai 2018 using Pikachu solely (since the tournament rules didn't allow character switching). He then won Kanto 2018 over wario in an upset using Falcon and Kirby as well as Pikachu in doubles along with Shirusupu playing as Kirby in doubles. His Twitch account kyskkyskkysk has also been used for several recent tournament streams, a change from old events which were entirely streamed on Niconico. This page was last edited on April 21, 2019, at 21:05.